If you've been following along my blog or Instagram for awhile then you've probably seen the updates and changes to our littles bungalow in the last couple years. We don't have a very big space, but I love creating a cozy unique feel with what we do have. I'm a little picky when it comes to picking out home decor, and I take my time to consider if I really want to invest in something whether its big or small. So, since being in our apartment i've kind of tackled room by room and our bedroom has been the last to get it's finishing touches. The most difficult for myself was finding good quality bedding for a reasonable price, up until I partnered up with Cstudio Home to finally give our bedroom that last piece to tie it all together. I ordered the Studio Quilt in Rose with matching shams, the 100% cotton makes it so soft and cozy! I was so impressed with the quality of everything, the first night in our new bedding was so comfortable, it made it that much harder to get out of bed in the morning! If quilts aren't your thing Cstudio Home has so many options to choose from such as duvets, comforters, sheet sets, and so much more to even accessorize with as well as mix and match your bedding to whatever fits your homes style. If you're looking to give your bedding a little facelift I highly recommend checking out Cstudio Home for your bedding needs. Overall the experience, quality, and price is unbeatable, I couldn't be any happier with our new bedding! 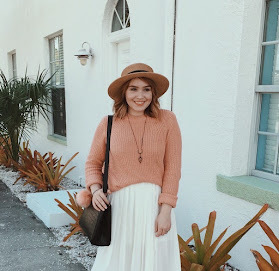 I am loving this sweater and skirt combo!